Garry with a good sized rainbow trout. 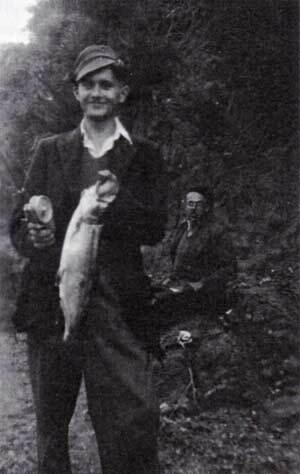 The author is delighted with this rainbow trout caught back in 1951. Charlie is in the background. Some years ago while driving South on the Main No 1 Highway we were passing through Rolleston. Opposite the Railway Station on the South side there had been land-scaping work done with mounds and undulations which has now been sown in grass and it now compliments the stone entrance way to the new town sub divisions at Rolleston. At the time there was a water drainage problem among the mounds and there was quite a large pond of water lying. Some wag had made up a ply template of the Lochness Monster with its many humps and set it up in the stagnant water. 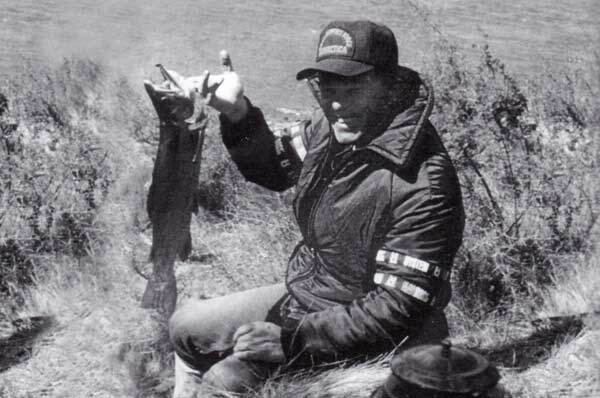 It reminded me of our early fishing trips to Lake Coleridge, starting for me in 1949 and through into the early 1960s. There was a story that circulated at that time of a monster that lived in the lake! I even have a newspaper cutting from the Press dated 23rd September 1978, written by Derrick Rooney who tells of fishermen of an older generation who have a legion of stories about the monster! He said that the most popular theory expressed was I a giant catfish, smuggled in as a stripling from the Mississippi River by a passing gold miner heading toward Browning Pass and the West Coast. I almost reckoned I saw the monster one night! An hour after sunset with the water like a sheet of glass, as I walked around the shore I disturbed several teal and they took to the water and swum straight out from the edge. With the dimness and the smooth water their wakes formed perfect V shapes as they moved further out. It would have been quite eerie to somebody who hadn’t seen the cause. Another time after dark, a friend was playing a lair sized fish when all of a sudden there was a vigorous extra pulling and tugging and we thought for sure the monster had a hold! However after a time he retrieved line and found a huge eel had hold of the fish. 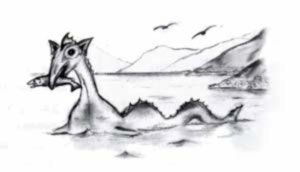 A story goes of a Lake Coleridge schoolboy saying he had seen the Monster many times and when pressed for details he said it was his teacher. One day we were walking along the tops of the cliffs at the bottom end of the lake, east of the intake to the power station, when we saw a huge fish below but we didn’t reckon it was the monster but probably a sea run salmon that had got into the top of the lake from the Rakaia River via the Wilberforce and Harper Rivers. In the still evenings that we have often struck at Lake Coleridge there can be an eerie feeling when you can often hear other people talking several kms across the water and there are other unexplained noises – the perfect time for the imagination to go wild and conjure up visions of monsters! Our fishing has mainly been concentrated around the bottom end of the lake near the Murchison homestead under the steep face of Kaka Hill and around to the area known as the Boat Harbour, under Lake Hill. We had permission to walk from the road over some high ground through the farm above the homestead to the lake for our fishing. Opening day was November 1st irrespective of the day it fell and after no fishing in the lake since 30th April our expectations were always high. If opening day was during the week we would manage to get off work early and head to Lake Coleridge in the mid afternoon. There would be a rush to gear up and catch that first fish. I remember one of our party caught a 6lb brown trout on his first cast and was very cocky but as the afternoon wore on all the rest of us caught several fish, but try as he may, Eric couldn’t catch another one. He wasn’t a happy chappy. We were pretty greedy in those days catching as many fish as we could. One opening day five of us started fishing mid afternoon and we caught 39 fish by dark. Usually we would expect to catch three to five fish each, a mixture of salmon, rainbow and brown trout. Nothing very big, a 5 or 6 lb fish was still a good size. Our gear was pretty primitive as we used baitcasters with weighted copper and silver lake spoons or a lead and a couple of lures being the normal gear. Leaping rainbow trout were quite a challenge to land on those short rods. Thread line reels with light gear were still many years away. Later we graduated to long rods with sinking line and lures for evening and night fishing. When opening day changed to the first weekend in November we would clamber over the hill to the lake to start fishing at midnight. We would usually catch a few fish in the first hour or two and then our enthusiasm would wear off and we would have a sleep by the camp fire and start fishing again at dawn. By mid day we were worn out and ready for home. We always hoped the North West wind would not be blowing as this often brought heavy rain and put a damper on the day. We also hoped that the lake water level was low so we didn’t have to plough through the matagouri and scrub around the shore and high water also restricted our casting. Boats were very rare. The track into the Ryton, where many boats are launched these days, was across a deeply rutted tussock area of private land. The present formed road came very much later. I remember arriving at the bottom of the lake one late afternoon and there was a strong North West wind blowing. There were large waves and spray was coming off the water. A group of people I knew were just leaving after a not too successful day. Within an hour the wind changed to the South West and the action started. It seemed that every cast a fish would take hold and within a couple of hours I had landed nine fish and lost many more. There were seven rainbow, a salmon and a trout. 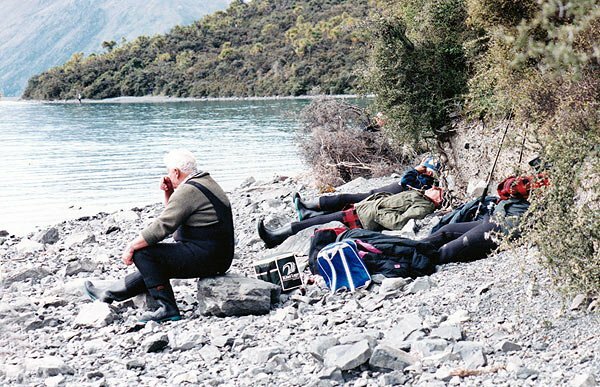 Our first fishing trips to Lake Coleridge were from Rakaia and it was quite a marathon journey on the shingle roads of the time up through The Mead and Te Pirita. Charlie introduced us to this area and we would travel there in his 1935 Hudson Terraplane car, a vehicle with a history. It had originally been a taxi in Ashburton and had been used in connection with a murder of a woman at Tinwald. Not a nice memory. When the lake had been very low usually when the intake pipes to the power station were being repaired or cleaned, we have found fresh water mussels in the Boat Harbour area. Also an assortment of fishing gear caught on the snags when water had been at a higher level. Over the years it has been nice to see a few crested grebes but I’m doubtful that they have been able to nest very successfully. At odd times we have seen their nests on an overgrowing willow with its foliage in the water. The estuary that has formed at the Murchison end of the lake which is fed by the Coleridge Stream has always been a prolific water fowl sanctuary and could hold some big brown trout in the area. It normally empties into the main lake at the Kaka corner. One night this water was very high and we kicked through the bank on the south corner for the water to flow into the lake and what wonderful lure fishing we had that evening, even if it did include several large eels! The very early start and all the excitement of Opening Weekend at Lake Coleridge takes a toll on you. These anglers can’t hack the pace and are taking a mid-afternoon nap to re-charge their batteries! Photograph: Allan Burgess. I remember later opening days when dozens of fishermen would drive down to the intake and then spread out along the shore towards the cliffs to the east. They would catch lots of salmon with many catching limit bags but this fishing fell off over later years. One particular pastime we had when going home from fishing was to attack possums on one particular stretch of road through a pine plantation. They were quite rare in the 1950s. When we got one in the car lights we would bundle out of the vehicle and after it with sticks and stones. One night a member of our party was in hot pursuit and in the long grass saw a possum sitting and gave it one almighty kick. It wasn’t a possum, it was a rock and he had his slippers on! A month later Jack was still limping.! As we look back we re- member those enjoyable and successful days but there were many days that weren’t as good that have faded from our memories. However, when I have visited the lake over recent years it doesn’t seem to produce as many fish as in the past, due no doubt to more fishermen, coupled with the winter fishing. Or is it, as we get older we don’t put as much energy and time chasing the fish?